AMD has announced the first three desktop CPUs in its new Ryzen line, the Ryzen 7 1800X, Ryzen 7 1700X and Ryzen 7 1700. 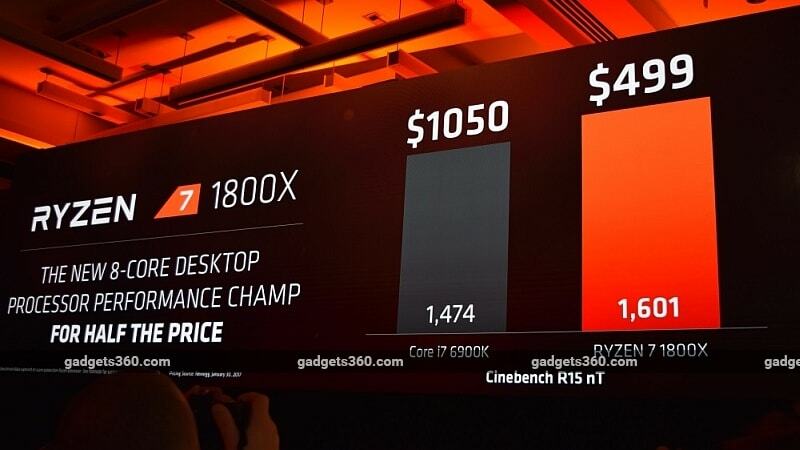 These are the first commercial products based on the Zen architecture which AMD has been working on for four years in an effort to become competitive with Intel in the high-end PC space again. At a press preview in San Francisco, company President and CEO Lisa Su announced that AMD has exceeded its stated goal of pushing 40 percent more instructions per clock with Zen compared to the previous Excavator architecture, and in fact has managed to achieve a 52 percent increase. All three Ryzen 7 models have eight cores and support 16 threads. They are manufactured on a 14nm process. At the top of the lineup is the Ryzen 7 1800X, which has a base clock speed of 3.6GHz and a boost clock of 4GHz. AMD says this is the fastest 8-core processor available in the market right now. The Ryzen 7 1700X has base and boost speeds of 3.4GHz and 3.8GHz respectively, while the Ryzen 7 1700 runs at 3GHz and 3.7GHz respectively. The 1800X and 1700X have 95W TDP ratings while the 1700 is a 65W part. Su demonstrated a Ryzen 7 1800X PC beating Intel's 8-core, 16-thread Broadwell-E Core i7-6900K in the Cinebench R15 benchmark as well as in a video encoding operation in Handbrake using identical configurations. Demonstrations of gaming performance also indicated superior performance, mostly thanks to the presence of eight physical cores. For workloads that don't necessarily benefit from having more cores, AMD still boasts of price and power efficiency advantages. AMD is hoping to take on Intel's Core i7 CPUs; not only the mainstream quad-core Kaby Lake models, but also the 8- and 10-core Broadwell-E models which comprise Intel's high-end desktop portfolio. In particular, AMD hopes to be disruptive by pricing the Ryzen 7 1800X at a recommended retail price of Rs. 37,999 ($499 in the US) as opposed to the $1,050 sticker price of the Core i7-6900K. The Ryzen 7 1700X is priced at Rs. 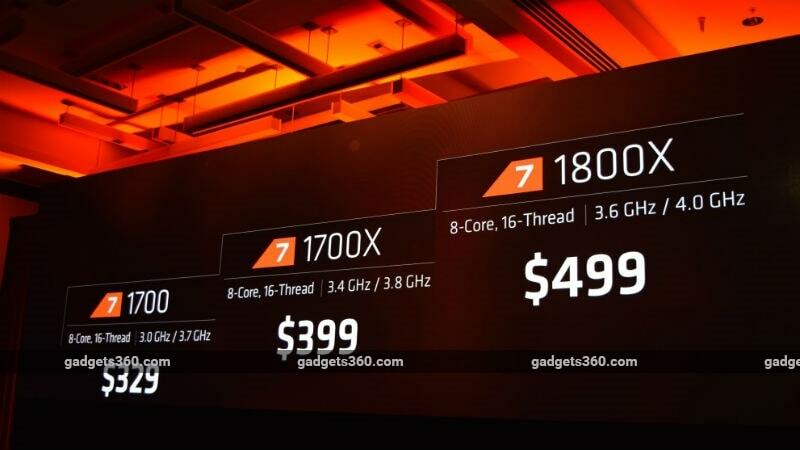 29,499 in India ($399 in US) and the Ryzen 7 1700 will cost Rs. 24,499 ($319 in the US) - each roughly $25 less expensive than Intel's Core i7-6800K and Core i7-770K, which they are positioned against. At an event in December 2016, AMD disclosed some of the tech that goes into its Ryzen CPUs. A number of sensors embedded into the fabric of each CPU die report heat and power data constantly, and can detect how effective the cooler in use is. If there is enough thermal headroom, Ryzen CPUs can push their boost clocks even beyond the rated spec, on the fly and without any user intervention. The frequency can be stepped up or down in 25MHz increments rather than 100MHz, allowing for quicker and more fine-grained power management. Efficiency gains are also realised though a new "neural net" which learns what kinds of workloads are being processed, and uses that to improve branch prediction and cache access. The three CPUs are available for preorder immediately, and will officially go on sale on March 2, in line with earlier reports. New motherboards with the AM4 socket will be available from Asus, Gigabyte, MSI, Biostar and ASRock on launch day. Boutique PC vendors and system integrators in many countries will have desktop systems available for sale immediately, with major PC brands expected to follow. 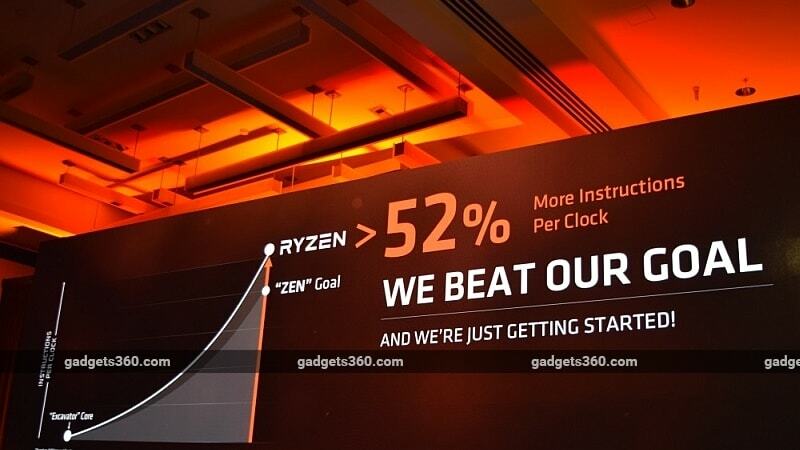 Information about the launch of other Ryzen models and mobile CPUs is not available yet, although AMD has already confirmed that its server-oriented "Naples" CPUs using the Zen architecture are scheduled to hit the market later this year. Disclosure: AMD paid for the correspondent's flight and hotel for the trip to San Francisco.